The following pages display a selection of nearly 40 tombstones that I photographed in the Jewish cemetery in October 2006. I estimated that this represented about 10 percent of the total. My aim was to test the feasibility of properly documenting all of the tombstones remaining in the cemetery. I am very grateful to Sara Mages, who did a wonderful job to transcribe and translate these tombstones from Hebrew into English, with remarkable efficiency. Her work demonstrated that, with experience and proper image enhancing software, the transcription and translation work might not be quite as time-consuming as one might expect, but it would still be a big job nonetheless. The same is true for preparing the material for display. Only three of the 40 tombstones I photographed were virtually illegible. Most of the others were completely or almost completely readable; except for the year and/or month of death (in about 10 instances). In some of these latter cases, the missing details may have resulted from obstructive vegetation or an unclear image, which might be ameliorated on another visit. Although the sample of tombstones selected was not random, and may well have been biased towards stones that were more clearly readable, this result holds out the promise that a substantial proportion - I would guess at least 2/3 to 3/4 - of the tombstones will yield substantial information. The tombstones shown on the following pages have been organised chronologically, ranging from the oldest to the most recent year of death: 1839 to 1935. This arrangement might be useful if one is looking for an individual, and one knows approximately when that person died. However, it's easy to see how this system might become unwieldy for a complete listing of 400 or more tombstones. Also, reordering them by year could have the undesired consequence of concealing useful information: for example, by "displacing" tombstones relating to family members buried close together in space (and therefore photographed together), but not in time. If organised instead according to spatial proximity of the tombstones, some educated guesses might be made about missing data (such as year of death), if it were the case that individuals in nearby graves were buried during approximately the same period. My 2006 field exercise demonstrated that, with sufficient time and resources, it would be feasible to document the entire cemetery. If all of the tombstones were photographed, ideally all of the information collected would be entered into a database that would be searchable by name, year of death, location in the cemetery etc. The latter would require at least a rudimentary grid system, to allow one to pinpoint with reasonable accuracy the location of each tombstone. An aerial photograph would be extremely useful - and perhaps essential - for this purpose. 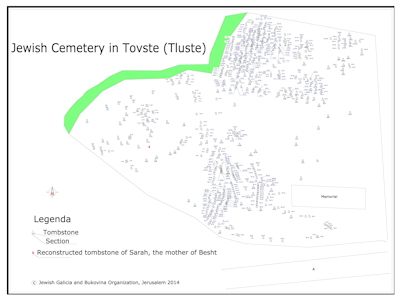 Fast forward to the present: I have since learned that, in 2014, the Jewish Galicia & Bukovina Organisation undertook a major effort that year to photograph, document and map the entire Jewish cemetery of Tluste. The images cover tombstones reported to date from 1678 to 1945, including more than 20 examples from the 18th century. The data collected for each tombstone includes: name of the deceased, family relationship, tombstone measurements, GPS location, and epitaph text (only in Hebrew). Importantly, it is possible to sort the data both by first name and by year of burial, which may facilitate the process of locating a person of interest. Click here to go directly to the Jewish Galicia & Bukovina Organisation website records for Tluste's Jewish cemetery. Click on the image to visit the map directly on the Jewish Galicia & Bukovina Organisation website. A short footnote to this story: In 2018, when I was in contact with the project leader, Ilia Lurie, I learned that about 30 of the tombstone photos were missing from the JG&B collection due to a technical problem. I have since re-photographed them so that the JG&B collection would be complete. Final thoughts: There is possibly more that could be done to analyse the available data collected by the Jewish Galicia & Bukovina Organisation, if it were organised in a database rather than a spreadsheet, and making comparisons with other historical information on Tluste residents in the 19th and early 20th centuries. Also, while the Jewish cemetery in Tluste is still in relatively good condition, some essential maintenance is required – especially for some tombstones that have already fallen over (or are about to), and risk being damaged or completely lost. The Jewish Galicia & Bukovina Organisation has undertaken excellent restoration work of this kind in neighbouring Buczacz. Lastly, it is worth noting that The Center for Jewish Art also has a wonderful, partial collection of black and white photographs of tombstones from Tluste’s Jewish cemetery, made in the late 1990s, including detailed inscription information.